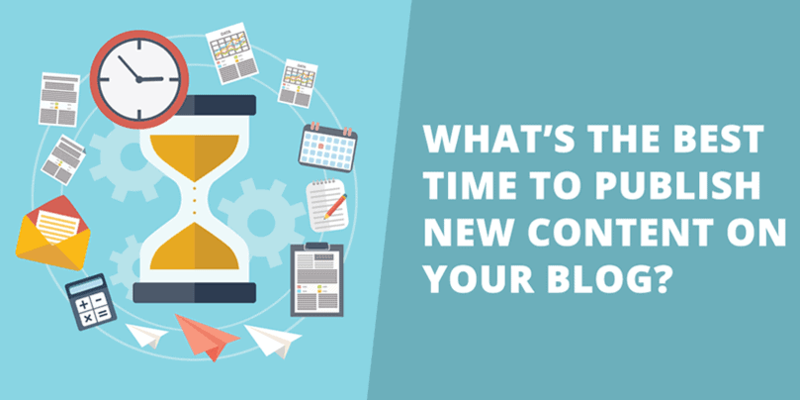 You are here: Home / Blog / What’s The Best Time To Publish New Content On Your Blog? Moving on from of our previous blog post on the best online business ideas, we’ll, today, take a look at the best time to publish a blog post along with the best days to publish blog posts and others. Building a website has become easier thanks to CMS like WordPress and premium hosting companies like BigRock that offers a host of BigRock coupon codes for the purchase of hosting and domain. But, managing your website, writing content and monitoring your site’s security can be a tough task. One simple example is this. Imagine the following for a bit. After spending hours writing and perfecting your blog post, you’re ready to click the publish button. Is this the right time to publish this post? Does it even matter what time I publish it? You’re wondering whether the day matters, whether the time matters. Heck, you’re even wondering whether you should adhere to a particular time zone. Well, here’s an article that will lay it all out for you, based on research conducted by popular blogs such as Search Engine Land, Kissmetrics, and others. While not setting up a publishing schedule is one of the blogging mistakes, instead of randomly scheduling it, it pays to know what time, days are the best. Thus, we’ll be looking at the findings of research geared towards analyzing the best time to post a blog, the best day to publish a blog post among others. However, although we’ll be looking at results garnered from various sources, keep in mind that the ideal way to know what is the best time to publish a blog post is to conduct your own research and steer your publishing based on what works for you. So, without further ado, let’s discuss the results. Before we dive into when is the best time to post a blog or what is the best day to post a blog, let’s first consider this. Although it is easier to believe that adhering to a particular time, whenever you want to send a post, will yield the best results, obviously, that is far from the truth. Each time-frame or posting schedule you choose is subject to its own set of pros and cons. Let’s plunge right into those pros and cons. Posting during this time will bring more visitors to your website, however because of high traffic, your content will easily be buried by other posts also targeting this same time-frame. You will receive more comments on your posts and a high visitor engagement, but due to the noise generated by all of this engagement, you are much more prone to higher bounce rates. Night time or low activity time has less noise, resulting in more prominent blog posts, but then again it is a time of fewer visitors and less engagement on your website. You might have an easier time with front page promotions, but also fewer comments and engagement. Having seen the pros and cons of posting at various times, let’s now look at the times that users actually grab their cup of coffee and log on to surf and read. 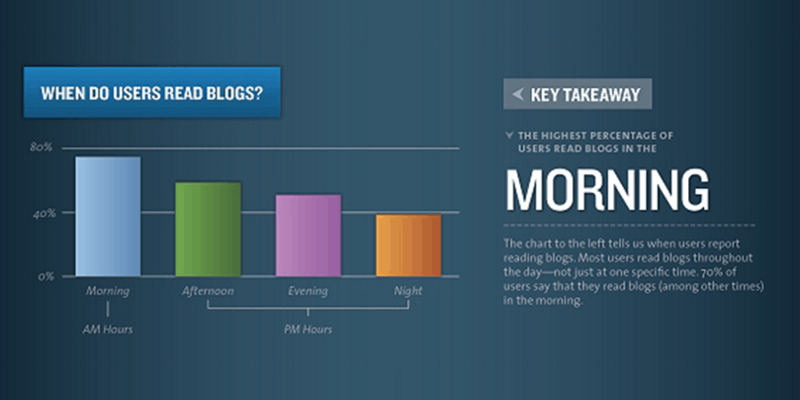 According to the findings of this study by Kissmetrics, most readers are prone to jumping onto the net in the morning hours. In fact, almost 80% of users are online during that time, in comparison to about 60% in the afternoon, about 50% in the evening and less than 40% at night. Thus, it is clear to see that although many are online in the morning hours, the distribution of readership is almost quite balanced throughout the day. Just as a reminder that this study was conducted using Eastern Time (ET). 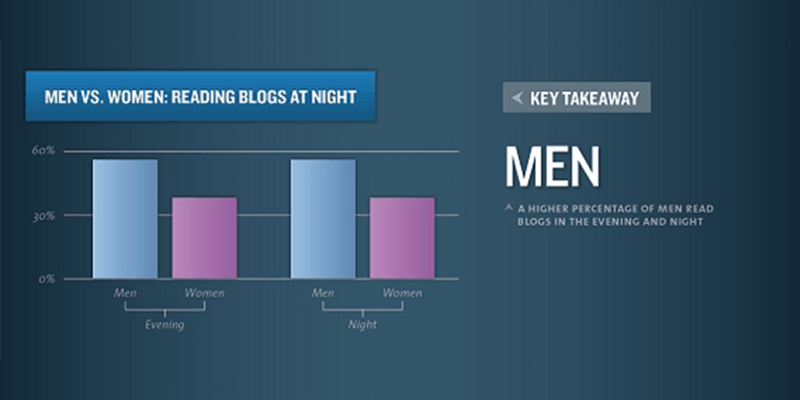 According to the findings, a higher percentage of men read blogs in the evening and at night than women do. About 60% of male readers, in comparison to about 40% of women. Interestingly enough, Monday is the day that is most frequented as the blog reading day, with Wednesday and Friday following suit. This makes ‘Monday’ the best day to post a blog. 11:00 AM is hands down the best time to publish blog posts as there’s so much going on at this time it’s insane. Whereas there is much activity going on in the blogosphere around Monday, Saturday at 9 AM is the day and time that most choose to air their opinions on what matters to them. Yes, that’s right. 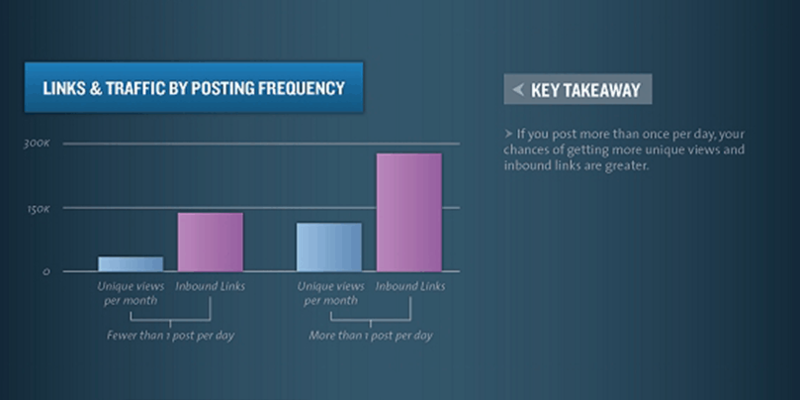 Fewer posts mean less traffic and fewer inbound links to your posts, whereas more than 1 post per day drastically raises the rate of inbound links and views. If you want more traffic then the best time to post a blog post is Monday at 11 am EST. Should you want more comments, the best time to post a blog is Saturday at 9 am EST. 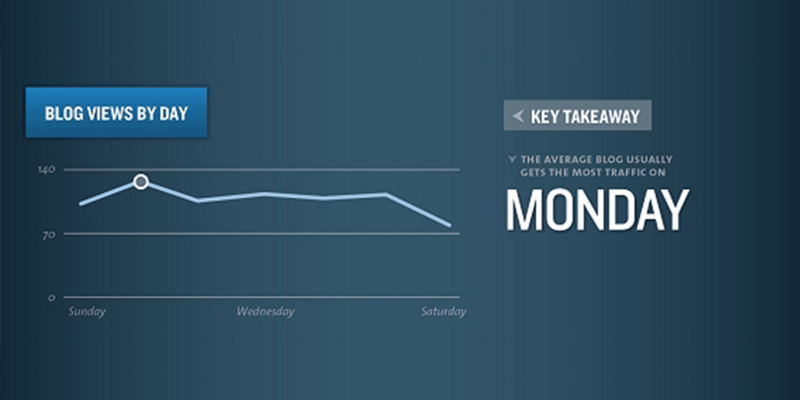 If you’re after inbound links, then the best days to publish blog posts are Mondays and Thursdays, at 7 am EST. I’m assuming that you might have plans to reach out on social media. Having a presence on the popular social media platforms like Facebook, Twitter and LinkedIn are stellar. With that, I mean having a constant presence, which includes keeping it alive, active and recent. According to a study by TrackMaven, publishing your posts on social media during hours that are not so popular tends to get the best social engagement and social shares. 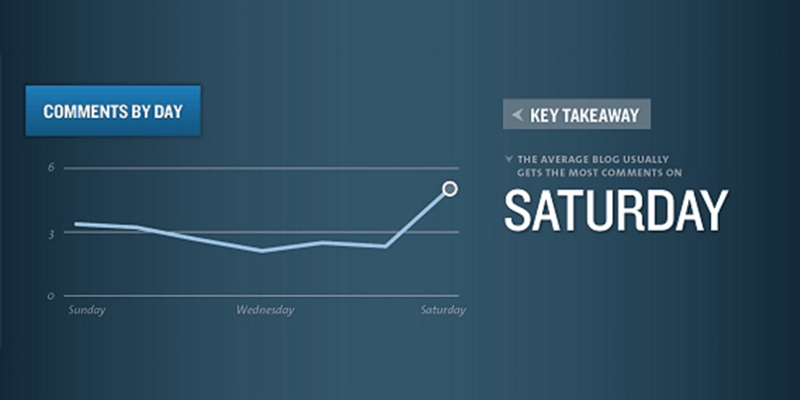 Publishing on Sundays, between 10 am to 3 pm Eastern Time, yields the most social share results. However, as I mentioned before, real statistics are the ones you can garner from your own research, and are applicable to your own situation. Data gathered by Shareaholic found that posts published on Thursdays between 9 and 10 AM EST have a much higher social share. When taking page-views into consideration, it is a completely different ball game. For higher page-views, you would need to post on Mondays between 9 and 10 AM EST. Page views show a considerate drop after 12 PM EST. Ever wondered how content goes viral? Well, lucky for you Noah Kagan did a study using BuzzSumo in which he tested over 100 million pieces of content to see what creates the viral buzz. 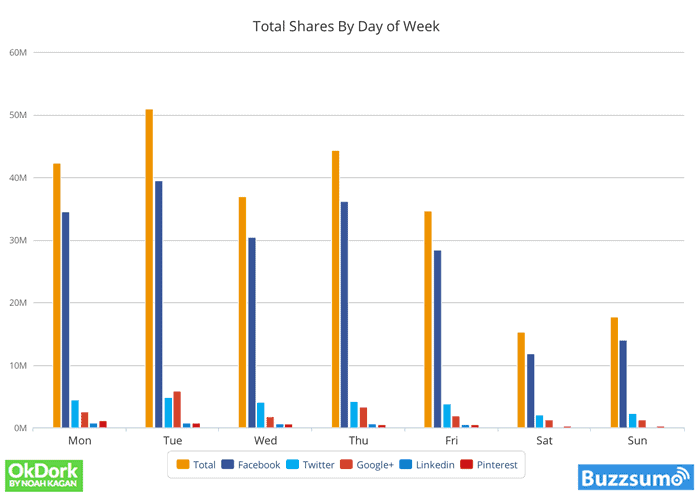 According to his studies, content published on Tuesdays gain quite the social share. The only exception being LinkedIn and Pinterest, which were frequented more on Mondays. Another contributing factor to wildly successful viral content is the length of the blog posts, with long posts being more popular. Other factors were images, types of posts as well as shares from an influencer. Just like in the case of Keyword research, as good as all these studies and results are, it is wiser to conduct your own research based on your own criteria. You might also find that your data varies greatly from the findings mentioned here. That could be because of the market you’re targeting being different, with different interests or goals. Only carefully aligned studies will be able to reveal what might work best for you and your audience. 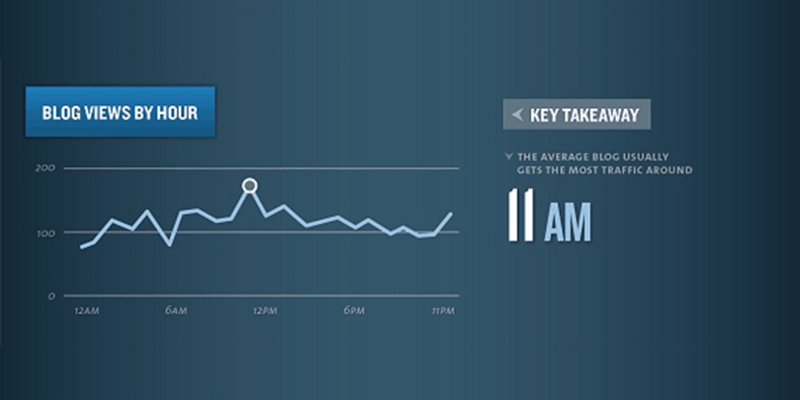 So far we’ve covered all the best times to publish blog posts. We’ve covered the days and the times, as well as looked at how to pair that off with the goals you want to reach on your blog. Do you want more shares, more comments or more links? I’m assuming that having read this content, you are probably of the inclination of wanting to try and get your own results. Getting these results is possible using Google Analytics. Google Analytics allows you to import page-views and visits to your site. From this, you can glean when you are receiving the most visitors to your blog. Not only do you get that information, but Analytics will also help you see how your traffic changes whenever you are posting new content. Right in your WordPress dashboard, you can see the effects your blog post publishing has on your traffic. Combining the knowledge you just gained through this article, in conjunction with your own research, geared towards your audience, you should be able to come up with a strategy that you can implement. Do this a couple of times and you’ll be able to gauge your audience and know exactly what they want, and when they are best able to receive it well. 9 Ways In Which Social Media Can Help In Increasing The Sales On Your eCommerce Website!